Woke up at 4 AM, 7:30, and 10:45 and finally got up at 11:30 – real lazy morning. I had hired Eric Anderson to modernize and update my IOL power calculation program (Hoffer® Programs) and he had emailed me about all he had done but he had many questions. So I spent most of the morning answering them. By 6 PM we all packed up and drove back to Dimitrii’s house in Arese. We beat Dimitrii so we had a cappuccino at my favorite haunt in Arese, Il Gran Caffe. He soon arrived and we went to the house so I could do my run on his new treadmill on the basement level. I got a little sweaty, but it was good. Because it was too late for Anastasia, only Dima went to dinner with us at Ristorante Caneva, where we have been twice before. They redid the place and it was very nice. The food was fabulous for our last night in Italy and I did email at his house until going to bed at 3 AM. Woke at 8 AM as Marcia was leaving with the cab to downtown Milano. 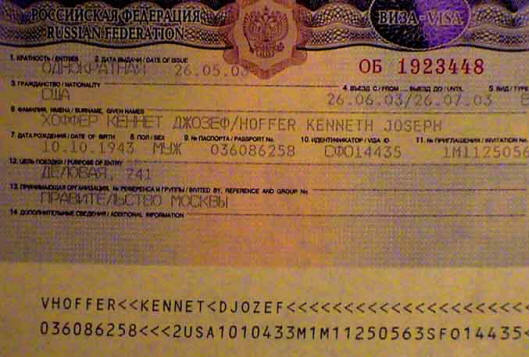 The unending story of the Russian visas. Getting a Russian visa is very difficult for Americans (and vice versa for Russians) and we planned this way in advance. Dimitrii got us an invitation from the Russian Ministry of Health after I sent him copies of our passports. This would give us 3 month long business visas allowing us to enter and leave Russia whenever we wanted during our 3 month trip. To give us the longest time, Dima waited until 2 weeks before we left to submit the documents. Problem was that neither Marcia, I nor Dimitrii noticed that Marcia’s passport was about to expire in June. By this time she had gotten a new passport but everything in Moscow was put on hold. We found out about this late and got the new passport in but now we had to wait for the invitations to be sent from Moscow to the Russian Consulate in the US. No problem except there isn’t one in LA, only in San Francisco and Seattle. We could have Fedexed our passports to have them stamp the visas but couldn’t take the chance they would be lost with only 4 days before we leave. My invitation was to arrive on Friday the May 23rd and Marcia’s on the 24th. Problem is the 24th is Saturday and the Consulate is closed and Monday is Memorial Day. Luckily the Consulate would be open on Monday. My son Kevin offered to fly up ($200) and get the visas. He did that Sunday night and the next morning went there and got my visa ($300) but Marcia’s invitation had not arrived. With us leaving the next day, I told him to fly back that day. So we flew to Europe with just one visa and now it was up to Dimitrii to see if he could somehow get one for Marcia from here [Americans must get them while in the US]. He called a friend who is a big wig at Aeroflot, the Russian airline and somehow he got her a tourist (2 week) visa in 24 hours. That is why she had to cab it to the travel agency to give them her passport at 9 AM and then pick it up at 3 PM (cabs for 2 round trips $140). I got up at 10 AM and ran on the treadmill again but half way through went out into the streets. I did email and sent Diario #2. Dimitrii and I had an appointment at 2 PM so an hour before he and I left for Lugano: Marcia would drive and meet us there. I hated saying good-bye to Italia once again. While driving, Marcia calls to tell us the visa was made for JUNE 10-24 instead of JULY 10-24. Somebody screwed up and Dima had to make a flurry of calls while driving to get someone to fix it, since now the Consulate and travel agency had closed. 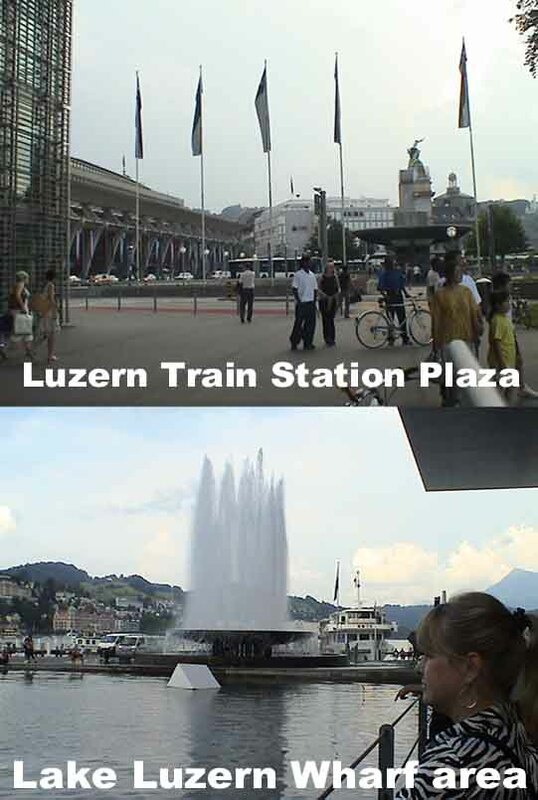 How he did it I do not know but finally Marcia called and said it was all set and she was heading to Lugano. 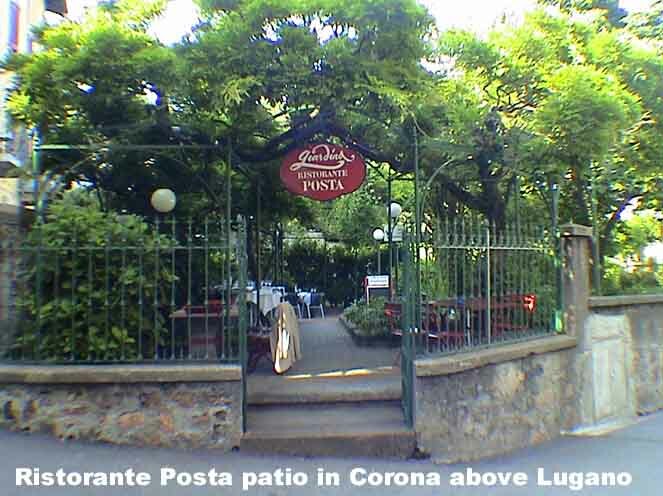 We had met some people while shopping in Lugano and went to a little restaurant in a town called Corona high in the mountains above Lugano which was very beautiful. The cows were especially nice. 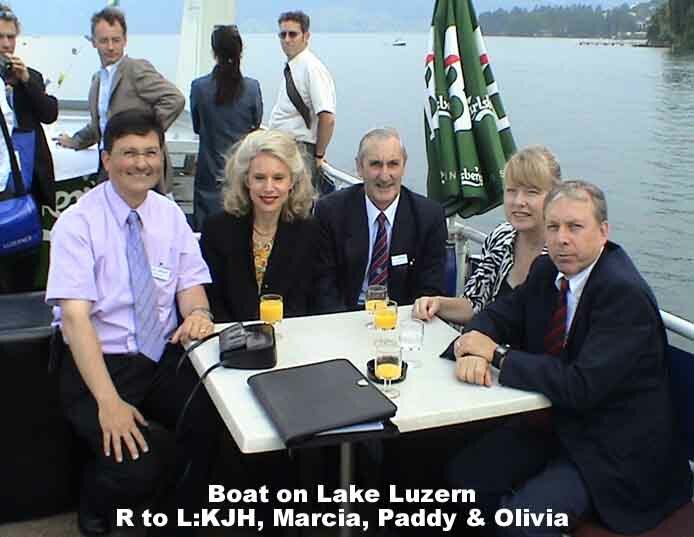 We finally headed out for Lucerne, Switzerland and told Marcia to just drive on and meet us at the hotel there. We had to drive through the 17 Km long Gotthard tunnel which took 15 minutes under Mt. St. Gotthard. Then I took over the wheel and finished the drive in. Marcia arrived. We all raced over to the Astoria Hotel where the Faculty dinner for the Congress was starting at Restaurant Latino. We had to sit at a separate table which was just fine since we got to meet Prisca Perler, the CIBA Vision rep for Switzerland. She and Marcia got along well and the food was excellent. 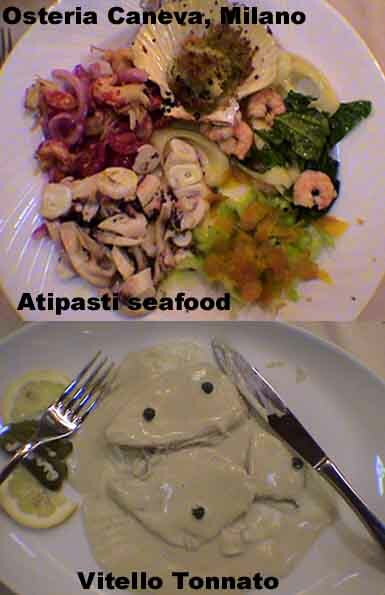 We had calamari stuffed with vegetables, beef with tagalini and lamb. Got to bed at a reasonable 12:30 AM. At 9:30 AM I woke up with a start because of the mural on the ceiling. I quickly dressed up in tie and jacket to get to the meeting which was two blocks away at a very nice setting in the Art Museum. At 11:40 I gave my lecture on ultrasound measurement in eyes with phakic IOLs; the computer worked fine. 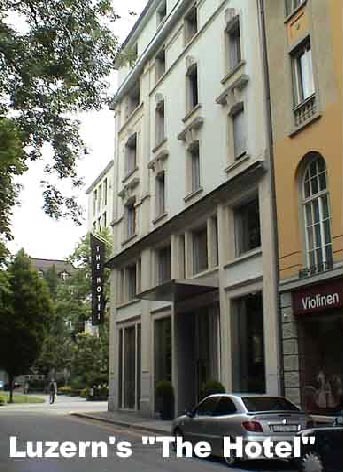 After the talk, I met up with Olivia Svardaric and we walked with Dima over to the Hotel Metropole where lunch was served. I skipped the food and had water. We went back to the meeting and listened to Dimitrii give his talk on modern IOLs and then he and I walked back to the hotel and met Marcia who had finished a full morning of shopping. We sat and had coffee and laid out our plans for the Russian part of the trip which will be from July 9th to July 17th. We said goodbye to Dima, who then headed back home to fly to the Madrid meeting the next day. I did my run through the streets of Luzern and this time no rain. When I came here to lecture in 1997, I had to do my run in the cold pouring rain. That lecture, which I reluctantly accepted after arm twisting by Dr. Urs Thommann, actually turned into an annual meeting here in Luzern and it keeps getting larger. I had to hurry because the Faculty dinner was leaving by boat on the "Bucher Stuffe" going to Vitzfeld. We met our friend, Paddy Condon, MD from Waterford, Ireland. We stayed a night at his house in 1999. We talked for quite awhile on the trip across the lake. We also met a young eye surgeon from Zurich (Peter Treub) who used to stay at Phyllis Bernard’s house in Santa Monica (our old neighbor). He informed us that her son Ashleigh had recently died at age 32. He is also a very good friend of Dr. Paul Dougherty who worked in my office during the summer we went to Italy in 1997. What a small world. The boat arrived and we had dinner at the Parkhotel Weggis. 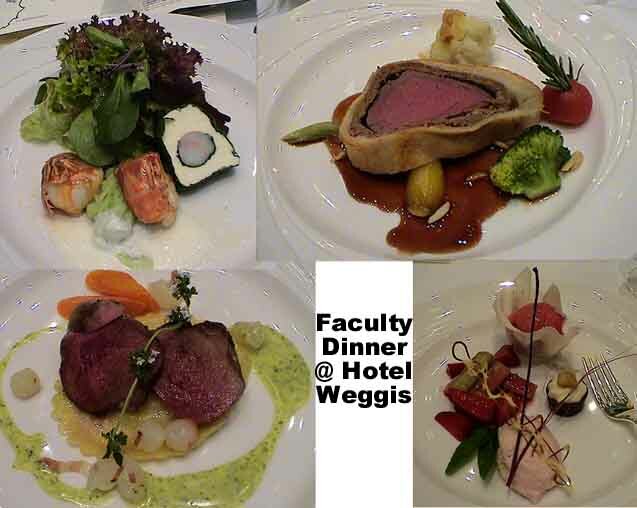 It was a wine tasting dinner with wines from South Africa (with famous vintner, Stefan Dorst). Paddy & I were the only ones that asked for a beer (and got one). The dinner was excellent and the boat trip back was a little chilly. Got to bed at 3 AM.